Lone wolf Randy Wolfowitz vehemently condemns terror attacks committed in his name. Whitehorse, Yukon – Fearing predictable repercussions after yesterday’s mass shooting, lone wolf Randy Wolfowitz held a press conference on Thursday sharply condemning terrorism in all its forms. A visibly frustrated Wolfowitz clearly expressed his contempt for the senseless violence conducted in his name. 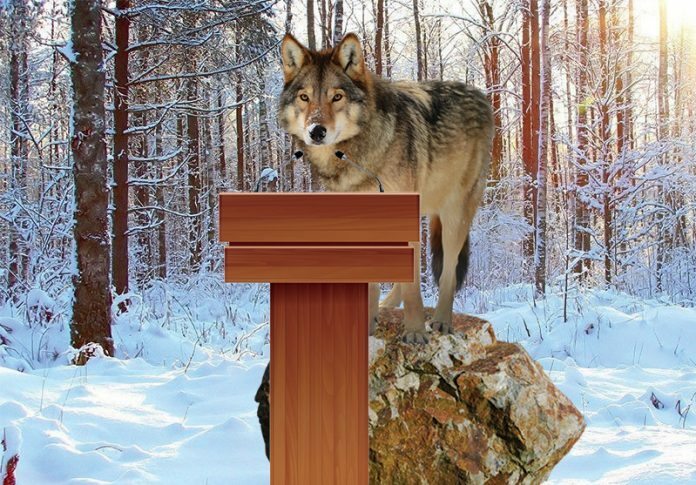 When asked if he spoke on behalf the rest of his pack, the gray wolf said he only represented himself. Wolfowitz also said he will begin public relations campaigns and outreach programs to combat any negative stereotypes against his marginalized persona. Wolfowitz then abruptly ended the press conference to howl at the moon.